Showcase your amazing personality and make your brand stand out with a professional-looking Twitter banner. Start from a template, or create custom designs using our creation tool. Why start from scratch? Now you can use one of our ready-made banner templates to create your next amazing Twitter cover! Check out our stunning collection of cover templates and choose the ones that fit your brand. With Bannersnack, e-commerce banners, branded headers, and even business cover photos can become more creative than ever. Creating a Twitter Banner has never been easier! Now you can save time and create a great visual without any design skills. Get in touch with your creative side and start designing the perfect Twitter Header! The Twitter cover is the first thing your potential followers see when they click on your profile. Make it matter with a creative banner that makes your brand stand out. With the new Bannersnack Twitter Cover Maker, you can create a banner easy and fast. Show off your creativity! A great banner can boost your awareness and make your customers notice you. 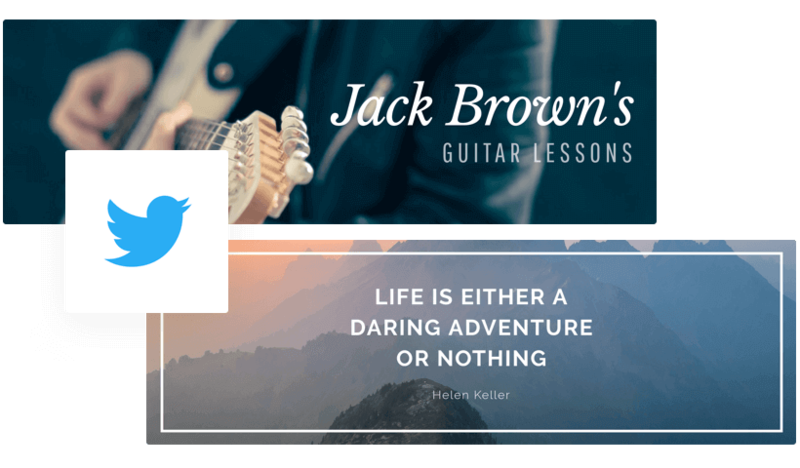 To create the best Twitter banner, focus on using fonts and colors that are relevant to your brand. You can go for an illustration, a picture or a text preset that defines your company. Don't be afraid to experiment with overlays, borders, and fonts! 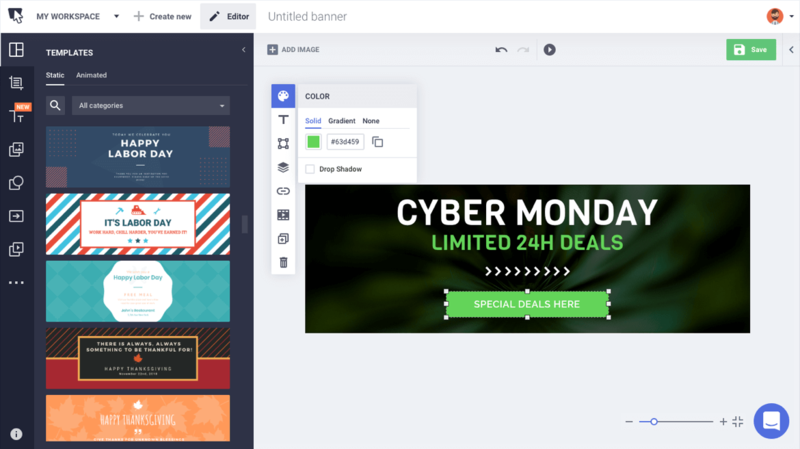 With Bannersnack, it's never been easier to create the perfect Twitter header! First, you have to choose the Twitter header size; the standard size is 1500×500 pixels. Go to the Social Media tab and choose the size that is perfect for this Social Media platform. You can choose from the hundreds of Twitter cover templates we made available to you. Speed up your creative process with our Twitter header maker. Get creative and add your own branding elements to boost your Twitter online presence. You can add your own fonts, images, and shapes. Once you're happy with your design, you can download it as a .jpg or .png file and upload it to your Twitter business page. Discover some of the most popular Social Media Cover Templates from Bannersnack and start designing yourself! Create the best social media visuals for Facebook, Instagram, Pinterest or Youtube. Keep your Facebook profile looking fresh with a new photo cover. Start with one of our templates and customize to your liking. Give your YouTube subscribers something to look forward to when visiting your channel. Enhance it with the amazing channel art it deserves. If your events don’t get the attention they deserve, perhaps a more professional looking Facebook event cover will help. Why not try it out? Whether you use Instagram for personal or professional purposes, we’ve got you covered. Use our editor to create post pictures or Instagram ads. Turn your videos into subscriber magnets with a well-designed YouTube video thumbnail. Make it eye-catching so you don’t miss any viewers. If you’re interested in advertising on Facebook you may want to create some amazing banners. Our Facebook banner creator is all you need. Bannersnack is a very flexible online tool. Don’t just use it as a Twitter banner maker when it can do so much more! You can use it to boost your entire online presence by creating banners for all social media channels and brilliant static or animated ads.